Exterior Aluminum Colonial and Bermuda Shutters! Cheaper Than Wood... Better Than Plastic. Our exterior aluminum shutters are maintenance free and made to last a lifetime. Choose from a selection of Louver Shutters including Bermuda/Bahama style, Raised Panel Shutters and Board & Batten styles. Our exterior aluminum shutters will enhance the exterior of your home nicely, and last for years with their beautifully durable powder coat finish. Click On One Of the Products Below for Pricing and Ordering! Larson's louvered exterior aluminum shutters are available in a decorative version with standard sizes that are 15" wide and available in heights from 24" to 80" on 4" increments. If the standard size louver shutters do not fit your needs, we also have fixed louver aluminum Colonial shutters in custom sizes which can be used in functional hinged situations. Louver options include "Z" blade, "C" blade and traditional oval louvers. The Raised Panel Aluminum shutter is available in 16" wide shutters and now we have them in custom sizes. If your design style calls for raised panel shutters this could very well satisfy your design goal. If you want more style choices of Colonial shutters take a look at our Aluminum Board & Batten shutters. The Board and Batten style is a decorative shutter, and will add style and distinction to your home, however these cannot be hinged for functional use like our louver or raised panel shutters can. These board and batten shutters are also available in both standard and custom sizes also. Check out this selection today in the current category. Bermuda shutters are also available with several options to customize the shutter for your needs. Available in the same color pallet as the colonial shutters so you can mix and match on your house as needed. 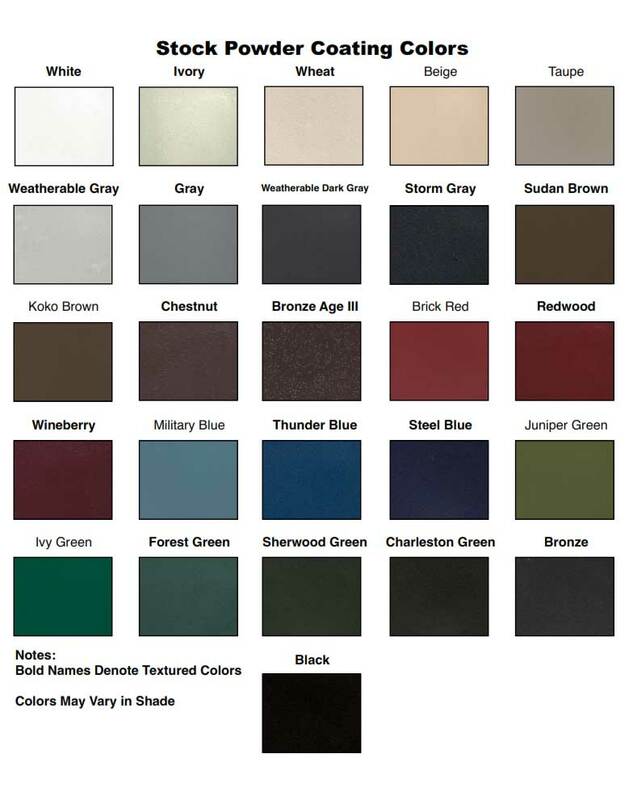 Choose from our large selection of durable powder coated standard colors in smooth and textured finishes shown below. Note: Colors can appear different on you monitor than they do on the actual product. When you are looking for a durable aluminum louvered shutters for your home we have great options for you. Our aluminum shutters come in a decorative standard size shutter, or if one of the standard sizes is not correct for your home choose from our custom size shutters. Whether it is decorative of functional working shutters for exterior windows, we have covered. Our aluminum louvered Colonial or Bermuda/Bahama shutters for exterior windows can be purchased with several options that will meet your design goals. There are three different louver styles available to choose from including a Z blade louvers, or C blade louvers, that we most often see used for decorative shutters that are not functional. The other option is a more traditional louver style and is the oval louver that is seen most often on functional working wood or composite shutters. Speaking of functional shutters, you can specify that your custom aluminum louver shutter be hinged. We will build the hinges onto these shutters for exterior windows. They are a great option if you want to use the shutters in a working, functional situation that allows you to close them on your window. Or for a slick looking install in a decorative situation, simply specify the hinged option on the custom shutter for your installation. This install method will give you a more authentic look with the dimension and shadow detail of working shutters, no one says you have to close them but you can still have the historic look of working shutters.